Consisting of 5 reels and 20 fixed paylines, Million Cents slot is a production of iSoftBet. This superb online machine is created on a dark backdrop, packed with pink and purple hues. The symbols that you’ll come across include: Triple Bars, Cherries, Double 7, Red Bar, Purple Bar, Brown Bar, Red 7, Blazing 7, Fortune and WILD! As soon as you launch the game, choose your coin denomination and number of coins! If you’d prefer to play with the highest value per line, make use of the Bet Max Button to put the max bet on max lines. On Million Cents Slot, all your winnings pay-outs start from left to right of the slot grid! The Autoplay option is well-presented on the game. Clicking on it will let you pick from 5, 10, 15, 20, 25, 50, 75, 100, 200, 300, 400, 500, 750 and 1,000 game rounds to put to play! 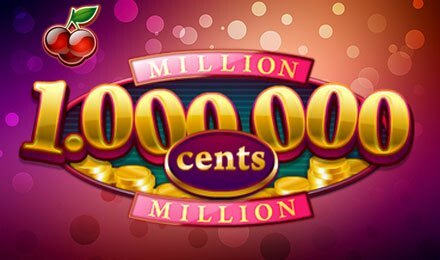 Bet Levels: The bet levels on Million Cents Slot vary from 1 to 5. Amount of Paylines Selection: Paylines remain active throughout your gameplay, it cannot be altered. Coin Values: Default coin denominations vary from £0.01, £0.02, £0.05 to £0.10.